Awesome! I highly suspect this will be making its way into a lot of mods (including mine). Thank you! You said to report any bad files? i got an error while unzipping on the PlanetVolcanic02-da.dds file. I think the process stopped at that error, so i'll see if there are any more. EDIT: just noticed there were separate folders for the different versions. It was in the "E" folder, and it did indeed stop the process so im not sure about the rest of E or any in the OS folder. I tested the archive thrice over before i uploaded it, So it has to be filefront... it figures. Ill try to upload a mirror using another host. All of the planet, and skybox meshes, and textures between the 3 versions are identical. If you get corruption from the download try redownloading the file first. If that fails then try to at least extract the GameInfo folders, and manifest's. The meshes, and textures are interchangeable between the versions. Try to swap out from one of the good folders. Edit: Mirror link is up. Hopefully this one doesnt wind up being corrupt as well. stress, you deserve a promotion to DE from Major for this mod, and the mirror did not corrupt for me , but the filefront one ONLY has one error on the planetvolcanic02-da.dds in the e folder, from testing with winrar. personally when I create the rars for uploading I always use the solid and recovery reord options, and they seem to help. Oh i aint done yet. I found a bunch of stuff that can use the major's "nerf bat" just in the textures alone. Once i am done ill upload an update. So far i got Original Sins 1.19 down from 1.25 gigs at startup to 995 megs. Most of this because of a simple switch from TGA format to DDS. Then some strategic reductions of particles. So far i found no need to use a 256 res particle texture when 128 gives the exact same result in gmae (no difference visually) using half the memory. Can someone tell me if the meshes themselves use more memory or cpu to run? Obviously less polys is better, but Sins has been known to run higher poly meshes smoothly on lower end machines. Holding off on any more poly reductions till that one question is answered. The ship textures themselves are as optimized as they are getting. The only thing that can be done with some is size reductions. Especially on ships like trade ships and builder units. where there are hundreds on the map at any given time. I just made a post regarding a map asking about these things. Awesome. I have yet to run a mod--this will be my first. Perfect idea. You are a genius...and excellent presentation here. Please keep us posted as to what you find and do. I wish I knew for sure, it dosn't seem like it would be the case, you don't even see many of them at any one time do you. There is no complex animations or transparecy, no special shaders. Obivously texture and mesh footprint dosn't matter in this case since once its in memory its not copied for each ship or anything stupid like that. Anyone know where Sins saving the Screenshots? Just re-enabled the two Skybox Options randomly a bit (seems its broken because it was a bit strange before i tested the Mod too). The Game runs a little bit smoother but i think there is something to do with the Airstrike Units, i'm not sure but when i enable the Cinematic Mode they lagging me much more maybe you can have an eye on that. Screenshots are saved in the same "Ironclad Games\Sins of a Solar Empire" folder where your mod folders are. In TGLF (taste great less filling) 0.01 I ONLY changed the main planets (Terran, Desert, Volcanic, Ice, and Gas Giant) and all Skybox's. Absolutely nothing else was altered. The current release is just a proof of concept that it can be done with very little loss of render quality. It is still very rough. The new planet, and skybox textures can use some more work, and cleanup. I am not surprised your strike craft lag you a little, because they werent touched at all.... At least not yet. Cinematic mode disables the icons, but as far as i know it renders all of the meshes hidden on the map. Even if they are zoomed so far out that you cant see them. So that causes a big framerate drop. Disabling Cinematic replaces the meshes with the icons. At least that is how i understand it. (Feel free to correct me if i am wrong). Speaking of Strike Craft. I am finding out some very interesting things the more i study Original Sins itself. The Engine Trail texture for the strike craft is 128x256 res. It may seem small, but imagine hundreds (or in the strike crafts case thousands) of these duplicated at once. I cant see how "instancing" prevents a sharp memory increase. So I reduced them to 32x64 res. You know what the visual difference in game was?.. ZERO. No difference at all. Even zoomed in all the way as close as possible to the strike craft. The engine trails look exactly the same at 64 res as the do at 256 res. The difference is a 120 kb memory savings. Now that may seem like nothing at all, but it is these little things that can make a huge difference when you add it all up. This is the goal i am trying to accomplish. I am so impressed by this effort. Fantastic work (just had to say it again). I am installing it now (my first mod) and will use it as a default. Feel free to request feedback as needed. Really looking forward to seeing how far this can go. I've always wondered what the deal was with strike craft lagging the game, now i know. I'm not much of a modder, but I do have a degree in 3D animation in 3d studio max, and am quite profitient in photoshop... If ya need any help, let me know - I would love to see this in full effect on the game. I am about 1/3 done hitting the Original Sins particles (not entrenchment or diplomacy yet) with the nerf bat. It is not as simple as just reducing the texture sizes themselves. I have to look over each texture both in game, and in photoshop after the nerf to make sure as little detail was lost as possible. If too much is lost then the texture gets reverted back to its original size. However most of the vanilla particle textures are in TGA format with no mip maps. In some cases just a simple conversion to DDS (with mip maps) is more than enough. Still i have to check the texture and make sure very litte loss occured with the conversion. A little is acceptable, but if the image pixelates then it is unacceptable. The next update to the mod 0.02 will be Planets, Skybox's, and Particles, and i am talking about ALL of the particles. It should be done tommorow, or by the weekend at the latest. Very good Idea. Have yet to try it out. As for TGA's, i think most of them could be converted to dds, except the ones for UI Elements (which would give by far and large the most savings) because in the UI every pixelation would be noticeable. But please correct me if I'm wrong. So thanks for the effort. In the end, I more than would prefer Ironclad to port sins to 64Bit. Transitions like this are not that much effort (as other developers have proven) and the instant benefit would be huge! Also it would make the engine more future-proof. If they ever plan to make a sins 2 (without dumbing it down to mainstream levels) they have no choice but make it 64Bit, so why not do it now and build up from there? And atm i think the same about the Strikecrafts, its not smooth with hundrets of them (100 Strikes, one Strike have arround 3-5 Ships (?) that are 300-500 ...). Maybe Tradeships are a Problem too but i think that there are many Textures wich are badly optimized and all together makes the Game so slow. So, is this mod only for 64 bit systems? Or does it improve performance for any system? He remove and / or reduce just some Parts of the Originals so its for 32Bit and 64Bit. I have to say im impressed with what you've been doing so far Major. 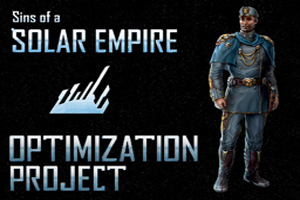 Once your further down the line we'll see about integrating this in to Distant Stars however we do use (as some others have pointed out) alot of extra textures in our mod which whilst wont degredate from using your changes may help us incorporate some other changes we've been talking about with the community lately. I'm glad to see your looking at optimising the strikecraft, because sadly those and trade/refinery vessels are infact the biggest lagger of the game. The games engine whilst good cannot handle processing the thousands some times tens of thousands of strikecraft that can build up which causes huge issues in lag. Good opportunity to add the Leviathon transport from Farscape *cough* (I have the HW model of it). What would be most helpful in regards to mods is perhaps a catalogue/change file detailing what files are altered in the Optimization mod--then the creators of those mods would have a template on how to modify theirs. Can we get a screenshot of the pole pinch problem? No need... Just download the mod and see for yourself. Its not bad on some planets but others it really stands out. Working on ways to fix the pinch problem. Already tried a pole pinch correction plugin for photoshop, but it screws the rest of the texture up. BADLY. The planet textures need to be re-done anyway, because i can do better with them. What is in now are just quick, and dirty textures just to see if this can be done at all. Distant Stars may have issues with the particles once i get finished with the particle release. As far as i can see thats the only issue. Just replace what i did with your own particles and you should be good. Strike craft meshes run between 500-700 triangles. Which is not bad at all. The textures are generally 512x512's which also isnt bad. However as the above pointed out there can be thousands on the map. How many of you remain focused on a single strike craft throughout an entire game. I think its safe to say nobody. They are pretty to look at, but can use the nerf bat down to 256's, or even 128's if the quality is good enough. As i said before we cant nerf them so low that they pixelate or lose tons of detail. Some loss will happen. The point is to keep it to a minimum. Ill experiment with this once i get to strike craft themselves. I will NOT change any gameplay aspect of Sins with this mod. Vanilla Sins stats will not be touched nor will amounts of craft per squad. 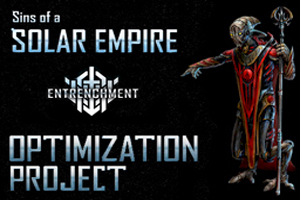 We are optimizing the existing game.. Not creating a new game. 1) Mesh poly count reductions, or re-building an existing mesh smarter. By not having 100 tri's on a square. Not having a bunch of hidden triangles which the game renders anyway. Not having 3500 tri's for a trade ship. Not 12,000 triangles for a starbase. Not using 200 triangles for something that really only needs 20 triangles. Bigger does not mean better. 2) Texture conversion, and re-sizing. Converting ALL TGA textures to DDS will improve the memory footprint big time. Resizing textures that are unnecessarily huge. The Skybox, Planet, Starbase, and some particle textures for example. Re-uvmapping existing models with more effeiciant textures. Ships that have an unnecessarily large texture. Builder units, and Trade ships dont need a 2048, or 1024 texture. 512 will work just fine. Starbases dont need a 4096 texture. 2048 will give the same result. 3) Eliminating as much texture "waste" as possible. The Planet, and UI textures are an example of this waste. Vanilla planets use 2048x2048 textures that 1024x1024 pixels of that texture is blank wasted space. With some models texture waste is unavoidable, but there are quite a few models in sins that can use a texture re-size, and re-uvmapping. The UI is also a big culprit in the wasted texture space department. with one big texture a good 80% waste. Again bigger does not mean better. Modelers are told to be a true artist you must present your ideas the best way that you can in as few polys (triangles) as possible. These are some of the methods i plan on using.. If anyone knows a quicker, better way, SAY SO. long day at work today.. tired. will talk more later. That is the reason why i wanted to know if the meshes themselves were more memory, or cpu intensive. Granted lower polys helps in ether case (especially for video cards), However Sins seems to have the ability to render higher poly meshes (for an RTS) with ease. The same poly counts Sins uses on engines like Homeworld 2, or Dawn of War would bring your system (even if its top of the line) to its knees. This is one of the main features that attracted me to Sins in the first place. The ability to run quality models on low end systems. If indeed it turns out the meshes use more CPU than system ram then poly reductions may not be necessary. Well, I'm convinced. This is going to be awesome. How long, you think, will it be until it's finished?